No game is the first half of the season is truly and completely crucial — there is still time to overcome any setback. This game is as close as it gets to a must-win in Week 6, though. If the Chargers win they’ll be two games up, and they will have the advantage in the tiebreaker over the Broncos so far as well. That’s a huge advantage. If Denver wins, though, there will be a tie atop the division, and the Broncos will have the head start in the tiebreaking advantage if it’s needed. In other words, the winner of this game won’t have the division wrapped up by any means, but they’ll be in better position to do so than the team that loses. Peyton Manning has a long memory, and he doesn’t like to lose. While he obviously hasn’t played the Chargers in his new uniform, he did last play them in 2010 when he was with the Colts. It was, in a word, a disaster. In one of the worst games he played in Indianapolis, he threw four interceptions, and the running game was hopeless. Indy lost 36-14 and was shut out in the second half. You can be sure that he’ll be looking to leave himself with fonder memories this time around. The story for the Chargers early in this season has been the same as we have become used to over the last several years. When they are good they look very good, but you can never really predict what team will hit the field for any game, or even any part of a game. The last three games are a perfect example. At home against Atlanta they were truly awful — as bad as they can play. The next week at Kansas City they looked solid — like a serious contender for AFC glory. Then they traveled to New Orleans. Early in that game they were again very strong, but they seemed to give up before the clock ran out and threw away a likely win. If the Chargers play like they are capable then they will win this game. That is, unfortunately, a very big “if”. The expectations for Manning were sky high when he arrived in Denver. It took him a while to get rolling, but for the most part he has done what was expected of him. His numbers are generally in line with what he has done in the recent past, and when you consider he’s working with a whole new team after a year off that’s pretty remarkable. If you take out his one lousy outing against Atlanta his numbers have been even better than expected. There’s just one big problem with what has happened so far — the team isn’t winning. They have dropped three of their last four, and they just aren’t quite strong enough at this point to be a real factor — you have to make the playoffs to win the Super Bowl, after all. Three big issues stand out. First, Manning has already been sacked 10 times — as many times as he went down in the entire 2009-10 season. The offensive line isn’t as sharp as it needs to be. That’s a problem for any QB, but especially for a guy as fragile as Manning likely is. Second, the offense just can’t hang on to the ball. DeMaryius Thomas has lost a fumble in each of the last three games, and that has contributed to a minus-six turnover differential. That’s right near the bottom of the league, and it’s hard to win when you are losing the turnover battle. Finally, the defense just can’t get off the field. That unit is averaging more than 35 minutes per game on the field. Manning can’t score if he doesn’t have the ball. If the defense doesn’t improve significantly the Broncos will go nowhere. A big key for the Broncos will be their ability to run against the Chargers. San Diego’s run defense has been very solid this year — among the Top 5 in the league. If the Broncos can’t establish the run then they will be much easier to defend, and their defense will spend even more time on the field because the offense won’t be able to burn the clock effectively. Just one running back in the last 12 games against San Diego has been able to surpass 100 yards. 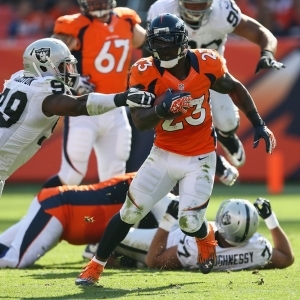 The good news for the Broncos is the fact that the RB was Willis McGahee. He had at least 117 yards in both games last year. Another showing like that this year would make this game more interesting than it could be. The game opened with the Chargers favored by the key number of three. Denver, thanks largely to the popularity of Manning, has drawn a strong majority of the action, and that has pushed the price down. It is widely at one point, and it can even be found at “pick ‘em” in spots. By the time Monday night rolls around there is a chance that the Broncos could even be favored. The total opened at 49.5 and has been basically stable at that level. The Broncos should hope they wind up as favorites because they are 0-4 ATS in their last four as underdogs. They have gone “under” the total in their last four against AFC West foes. The Broncos are just 2-8-2 ATS in the last 12 meetings between these teams. The favorite is 7-2-2 ATS in the last 11 meetings. I hate trusting the Chargers in the Norv Turner era, but I just can’t avoid it here. The Broncos have too many holes, and they have not been consistent enough recently. I’ll wait for the line to fall as far as it will and then jump on the Chargers — and the under at the same time.